The Secret Kitchen is a monthly event pairing local ingredients with a chef-celeb at an undisclosed location. With backing from Muskoka Brewery, this supper club is the brainchild of Ivy Knight (of Swallow Food) and Chef Matt Kantor. 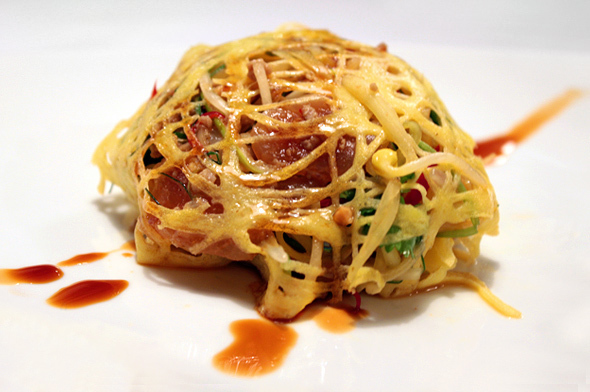 The only information given prior to the event is the names of the chefs, the main ingredients and pairings. Working the room, both front of house and back, Knight was pulling double duty setting the evening at a steady pace. We chatted briefly about her goal of creating a unique space where both the patron and chef would feel liberated and inspired to start a conversation. The Secret Kitchen does break down that fourth wall, as we found ourselves mingling with food fanatics and chefs alike. Six courses were served: the top three by Chef Nick Liu and the remainder by Kantor. Overall, the plating and presentation were gorgeous, as was the imagination put into the dishes. But as the night progressed some inconsistencies arose. Sturgeon and caviar were the ingredients to be incorporated in all dishes that evening — even dessert (but more on that in a moment). 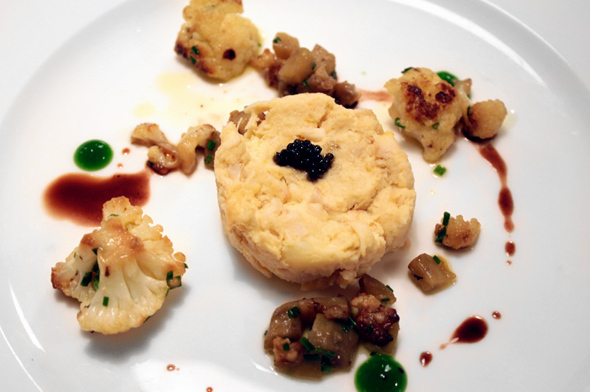 Cornel Ceapa of Acadian Sturgeon and Caviar provided the roe from his farm in New Brunswick. 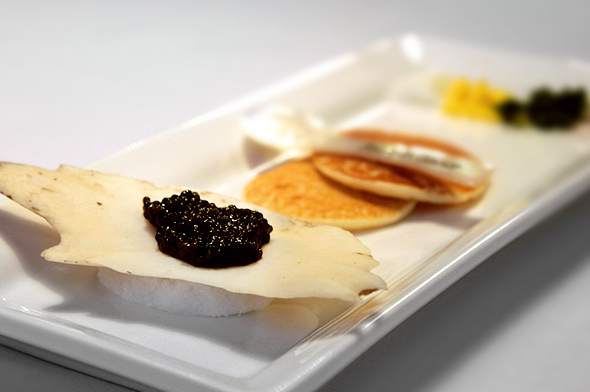 In the first course, the caviar singed beautifully on a blini accompanied with classic garnishes. The delicious caviar was briney, earthy and, since it was sustainably farmed, guilt free. Our second course was a Sturgeon bone marrow soup with a deep fried yolk and panko crumb. 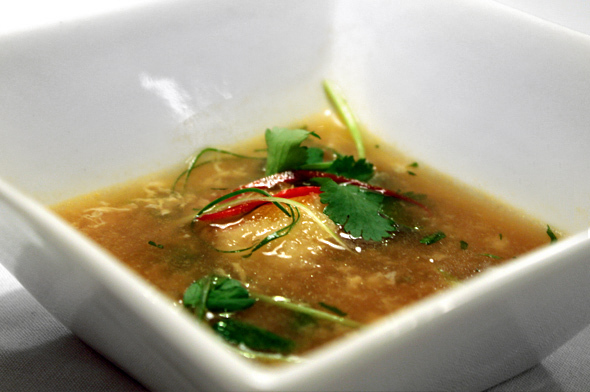 More than just an egg drop soup, the fumÃ© was delicate and would've pared nicely with the yolk, which unfortunately had set by the time my spoon pierced it. For the third course, we were treated to an egg nest of Sturgeon, pomello and a variety of other ingredients too numerous to list. Liu's technique for the egg nest webbing was spot on. Next up was a Sturgeon Brandade surrounded by a cauliflower and eggplant salad with parsley puree and coco oil. I must admit my reluctance to the idea of the coco oil, but it was a surprise fatty bitter note that bounced off the starchy brandade. Alas, the whole dish was sorely under-seasoned. It needed some S+P. 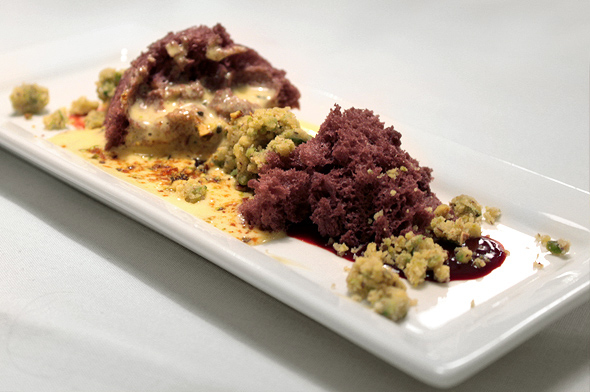 To round out the evening, we were served a sous vide Sturgeon atop a swoop of beet puree and Sturgeon pudding. Half of our table loved the dish, while the other half were served an overcooked piece of fish. The sous vide compressed the protein into a solid block too tough to cut. Perhaps, I just lucked out that round. Lastly dessert, a pistachio crumb, with a caviar creme anglais, atop a cake crumble was surprisingly the best dish of the evening. The caviar could've easily been a gimmick but actually enhanced the dish with little pops of saltiness. The Secret Kitchen is ever changing and evolving — only the beer will stay the same. A natural extension of the pop-up fad, this supper club will exist for only one night at a time never to be replicated again. That immediacy does lend an air of excitement to the evening. So if it was beer and caviar this round, is it safe to say champagne and pretzels for next?